1. Preheat the oven to 200°C, gas mark 6. Place the peppers, chillies and carrots in a large roasting tin and spritz with the olive oil spray. Roast for 50-60 minutes, until all the vegetables are tender. 2. Meanwhile, place the stock and lentils in a large pan. Cover and simmer for 30 minutes or so, until the lentils are soft, then tip the vegetables and their juices into the pan. 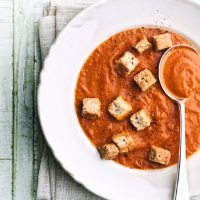 Using a hand-held blender, whizz the soup until smooth. Ladle into bowls and scatter over the croutons to serve.